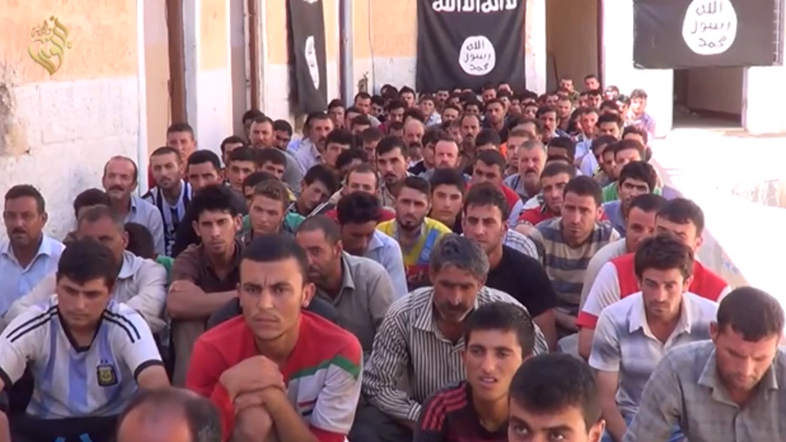 The Islamic State of Iraq and Syria (ISIS) has released a video showing the mass conversion of dozens of members of the Yazidi religious minority to Islam. In the 11 minute video released by the group, an ISIS fighter tells the camera why they wish for Yazidis - thousands of which were stranded on Iraq’s northern Sinjar mountain to escape from the militants - to convert. The video then shows what are purportedly Yazidi men getting off a bus and embracing ISIS fighters, before sitting in a large room decorated with ISIS flags and listening to an address. The Yazidis then grimly recite the Muslim invocation of faith: “There is no God but God and Mohammed is his messenger,” after which they begin a prayer. The men are then interviewed about their conversion and apparent new-found faith, and are then shown each hugging who appears to be an imam. Meanwhile, 1,000 Iraqi women captured by militants from the Islamic State of Iraq and Syria (ISIS) may be being coerced into marrying the radical fighters. The captured women have been divided into groups of younger and older women, according to witnesses, and are not being threatened to convert. Since early this year, Iraq has been facing an onslaught by ISIS and allied Sunni militants across much of the country's north and west. The crisis has worsened since June as the militant fighters swept through new towns in the north, killing dozens of people and displacing hundreds of thousands, mainly members of the minority Christian and Yazidi religious communities. Earlier this week, the son of the religious minority’s leader said that the world was not going enough to stop a “genocide” of the Yazidi people. “We call upon the free world to immediately act," said Breen Tahseen, an Iraqi diplomat based in Britain and the son of Prince Tahseen Saeed Bek, the leader of the Yazidi people. The ISIS attack on Yazidi villages in the area of Mount Sinjar began in early August, the latest chapter in an offensive that has seen the jihadists seize large swathes of Iraqi territory, forcing minorities either to convert to Islam, flee or be killed. 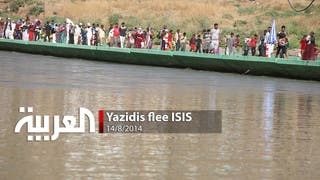 Tens of thousands of Yazidis fled into the mountain. They remained under siege with little food and water for more than 10 days, until Kurdish fighters on the ground and U.S. air strikes eventually enabled most of them to escape. Iraqi religious persecution hits home in U.S.